Theater provides so many opportunities for expression for both children and adults. Through creativity, theater program participants learn new ways to communicate with the world, and have a lot of fun doing it. Our current line of theater classes are a huge hit with our students, allowing opportunities to learn some new skills and to show of their hard work at the end of every 10-week session! For a complete list of current class offerings through PAC, be sure to check out our calendar page! Or if you’re ready to sign up, be sure to register today! For tuition information, please visit Tuition and Fees. Call 508-875-5554 for more information about group dance classes. See registration form below. 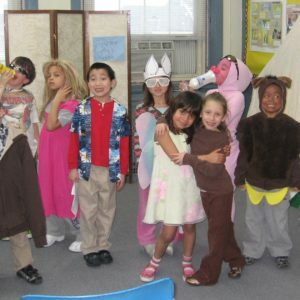 Specially designed to appeal to children, these theater classes are a favorite around PAC. From improvisation games to performances for friends and family, these classes truly engage children, inspiring an early love of theater arts that will follow them through the years. Children will use their voices, bodies, and imagination to play theater games and act out stories. There will be a performance for families and friends on the final day of class.